Looking for a Windows 10 tablet that doubles up as a powerful laptop on occasions? Well, we have got some for you right here. The best of the best tablets that have enough juice to let you create a powerpoint presentation. With the lines between laptops and the ones with detachable keyboards getting blurred, these 2-in-1 products have gained momentum. As to why people should invest in a Windows 10 based tablet is because of portability. A majority portion of people work in transit and having a Windows tablet during the journey can boost productivity to a great level. 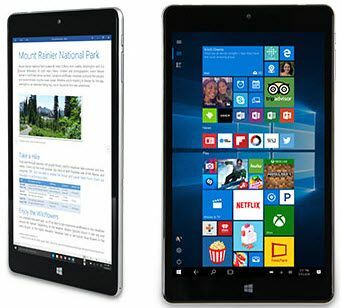 Tablets running Windows 10 are the same as laptops due to the consistent interface of Windows 10 which is being leveraged to manufacture devices varying in sizes to appeal to a mass audience. 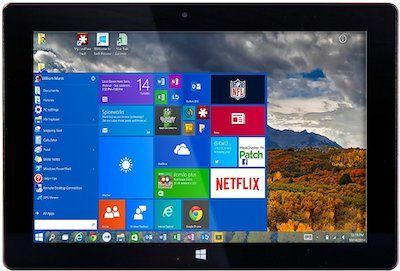 A Windows 10 based tablet can run everything that a laptop or PC can but comes with out-of-the-box portability. The same can’t be said for regular laptops. So here are our top picks for the best tablets running on Windows 10. What’s better than a Windows tablet from Microsoft themselves? 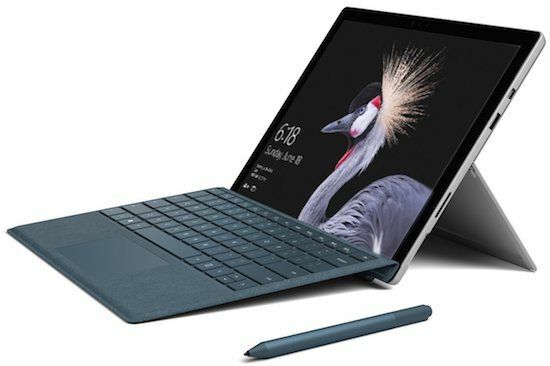 The new Surface Pro features a seventh generation Intel Core M processor backed by 4GB of RAM and 128GB of SSD storage. It’s also the lightest Surface Pro weighing just around 1.69 lbs. This ultra-light Windows tablet features a 12.3-inch PixelSense display with a resolution of 2736 x 1824 pixels and supports touch input. 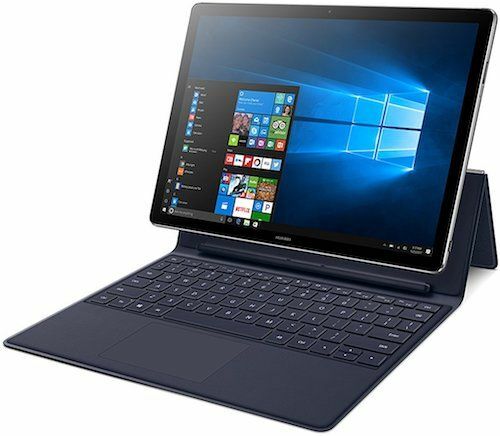 The new Microsoft Surface Pro is perfect for college going students and users who consume a ton of online content as the tablet viewing mode is just perfect for binge-watching your favorite Netflix show. 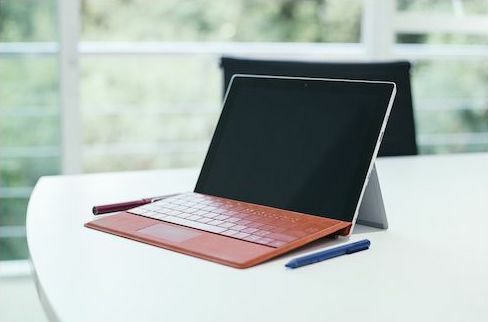 To get the whole Microsoft experience on the Surface Pro, users can also opt for a Surface Pro Signature Type Cover, Surface Pen, Dial and Arc Mouse which are available as separate accessories. While the detachable Surface keyboard makes it easier to work on-the-go, the Surface Pen and the Dial are perfect for 3D designing. The Surface Pro provides up to 13 hours of battery life on moderate use which is good enough for students and designers as it delivers the best balance of performance and battery life at the same time. Hence, the Microsoft Surface Pro 4 is our top pick for the best Windows tablet with its unrivaled portability and versatility. Microsoft Surface Pro with Intel Core M, 4GB of RAM and 128 GB of storage retails at $630. It is also available with Intel Core i5 and i7 Processors with storage options up to 1TB. The Surface Go is a 10-inch PixelSense display which is handy and easily portable. 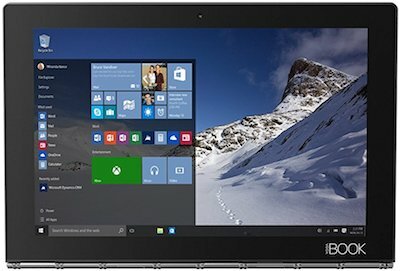 Being powered by Intel Pentium Gold with 8GB of RAM and 128GB storage, this is a laptop in the guise of a tablet running Windows 10. The 10-inch form factor of the Surface Go makes it a good option for regular browsing, typing, and binge-watching. This, coupled with the fact that it weighs under 1.15 lbs and provides up to 9 hours of battery life makes the Surface Go a strong contender. 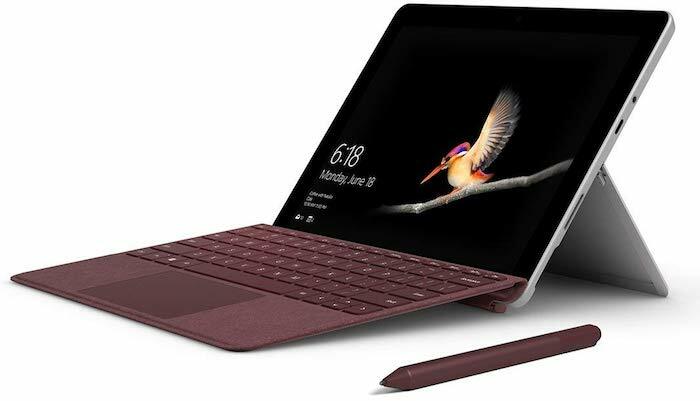 Microsoft Surface Go comes with USB-C and supports fast charging. Like the Surface Pro, the Type Covers are sold separately. This version of the Microsoft Surface GO retails starting at $565. Touted as the world’s thinnest and light-weight tablet running Windows 10, the Yoga Book from Lenovo is a delight to work on. It features a 10.1-inch full HD display which has a resolution of 1920×1200 pixels and is supported by Dolby Atmos speakers to boot. The Yoga Book doesn’t have a physical keyboard and as such, there’s just a black pad accompanying the display. The magic is when it lights up to show the Halo Keyboard which is a capacitive on-display keyboard with support for haptic feedback while typing. The Yoga Book has a unique 360-degree hinge which assists in different operational modes. These names are the Create, Browse, Watch and Type modes. Lenovo ships the Yoga Book with a pen and a note diary for users to digitize their notes and to draw on the Yoga Book. The pen works as a stylus and the Halo Keyboard quickly digitizes your notes. Lenovo’s Yoga Book is powered by an Intel Atom x5-Z8550 Processor with 4GB of RAM and 128GB of storage. The Yoga Book can last for up to a day on a single charge. The Yoga Book is priced at $563 for the Carbon Black variant. Users can further choose between Pearl White and Ruby Red color options. This ultra-portable laptop by Asus features a 10-inch IPS WXGA display, is just 0.35-inch thick and weighs 2.2 lbs (w/ keyboard) thanks to its aluminum build. The Asus Transformer Mini is powered by Intel’s Core x5 clocked at 1.44GHz which is backed by 4GB of RAM and 64GB eMMC storage type (expandable via microSD card). Asus Transformer Mini is built for productivity on-the-go as it’s highly portable nature will let you carry it anywhere and everywhere. While we won’t recommend you to binge-watch on the Transformer Mini, it’s perfect for casual YouTube viewing. The display panel is bright and is supported by Asus Tru2Life Video and TruVivid technologies that assist in an accurate picture and video reproduction on screen. The 10-inch laptop has all the I/O ports a user would usually need. It’s got a USB, micro USB, micro HDMI, microSD and 3.5mm ports. The Transformer Mini provides up to 11 hours of battery life on a single charge, although we’d have wished the inclusion of a USB-C based fast charging instead. 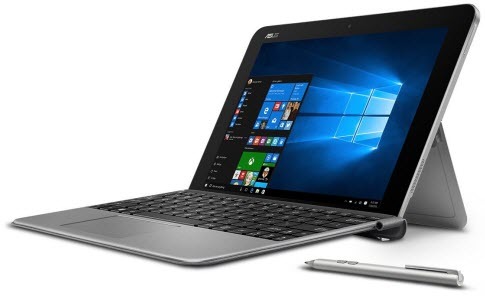 The Asus Transformer Mini is priced at $349 on Amazon. The MateBook E Signature Edition is every bit a laptop as it is a tablet. It features a 12-inch 2K display which has a resolution of 2160×1440 pixels making up 84% screen-to-body-ratio which is great for watching content. The display supports 85% NTSC color gamut which renders vivid pictures and videos. Huawei’s MateBook E Signature Edition is powered by seventh generation Intel Core M3 processor which is backed by Intel HD Graphics 615. This configuration is supported by 4GB of RAM and 128GB of flash storage. Additionally, the MateBook E supports Dolby Audio Premium which optimizes audio delivery in a form factor this small. The MateBook E is elegant in looks courtesy of its aluminum alloy built which will woo a lot of business users. The tablet is just 6.9mm thick and the chiclet keyboard that comes along is detachable. There’s a fingerprint sensor on the side edge of the MateBook E which works in tandem with Windows Hello. All in all, a really elegant tablet that doubles up as a laptop for a price of $475 on Amazon. 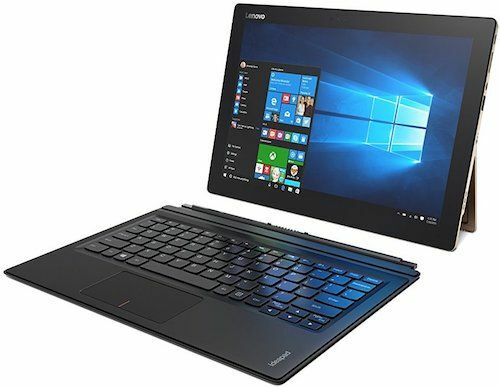 The Lenovo IdeaPad Miix 700 is a detachable 2-in-1 laptop that features a 12.2-inch Full HD+ display which has a resolution of 2160×1440 pixels. The Miix 700 is powered by an Intel Core m7 processor clocked at 2.2GHz which is backed by 4GB of RAM and 64GB SSD storage. For $449, you get a full HD display, powerful Intel Core M processor and a premium built. The dual watchband hinge on the back can be expanded to any angle comfortable for writing or watching. The detachable folio keyboard connects to the display via pogo pins. Lenovo also offers the Active Pen as an additional accessory to scribble on the display. The IdeaPad Miix 700 could be a really good option for people on the lookout for an ultraportable laptop that is a bit premium looking as well. 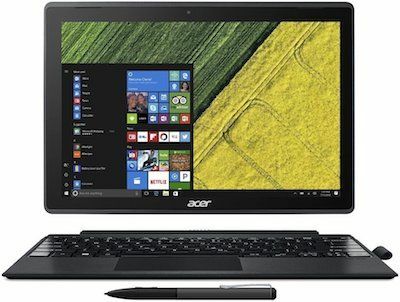 The Acer Switch 3 is an ultra-portable tablet that can also work as a full-fledged laptop for some users. The Switch 3 features a 12.2-inch Full HD IPS display which has a resolution of 1920×1080 pixels and supports touch input. The internals boast of Intel’s Pentium N4200 processor with clock speed of up to 2.5GHz, backed by 4GB of RAM and 64GB of storage which is expandable via SD card. The Switch 3 has a 2-cell Lithium-Ion battery of 4,670 mAh capacity which can easily last a day on moderate usage. As for the input ports, it comes with a USB Type-C and one Type-A port. Acer also includes the Active Pen with all the Swift 3 units. The Active Pen works in sync with Windows Ink that allows users to draw and write on the screen itself. Acer Swift 3 retails for $449 on Amazon. The ALLDOCUBE KNote is a pretty great offering at a $300 price point. The KNote features an 11.6-inch Full HD IPS display with a resolution of 1920 x 1080 pixels. The display sits flush over Intel Celeron N3450 processor clocked at 2.2GHz with 4GB RAM and 64GB eMMC storage option. The whole thing is just 8.6mm thin and can be placed on an adjustable keyboard which is included in-the-box. The KNote also has dual speakers and a battery capacity of 8,000mAh. NuVision tablet is essentially Windows 10 in your pocket. It features an 8-inch IPS Full HD display with a resolution of 1920×1200 pixels and also supports 10-finger multi-touch input. The tablet is powered by Intel Atom Z3735F processor clocked at 1.33GHz and supported by Intel HD Graphics. This is backed by 2GB of RAM and 32GB SSD storage which can be expanded via microSD card. The I/O ports include a micro USB, microSD, micro HDMI and 3.5mm headphone jack. 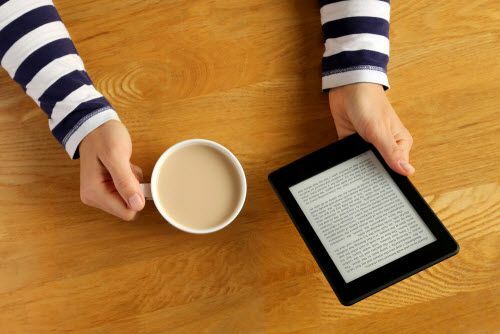 The tablet offers a battery life of up to 6 hours on a single charge. Overall, the Nu-Vision is the best cheap windows tablet on the market that offers a good package of features except for the mediocre performance. At just $85, you get this beast of a device that’s usable in more ways than one. This 10-inch tablet by Fusion5 comes cheap at $179 and features an HD display which has a resolution of 1280×800 pixels. It runs Windows 10 on an Intel Quad Core processor with 2GB of RAM and 32GB storage which is further expandable. The tablet is perfect for watching YouTube videos and binge-watching your favorite shows on Netflix. Along with that, it works well for occasional browsing and checking your social media feeds. Those were our top 10 picks of tablets running on Windows 10. The tablet market is getting really crowded but with more efficient products. 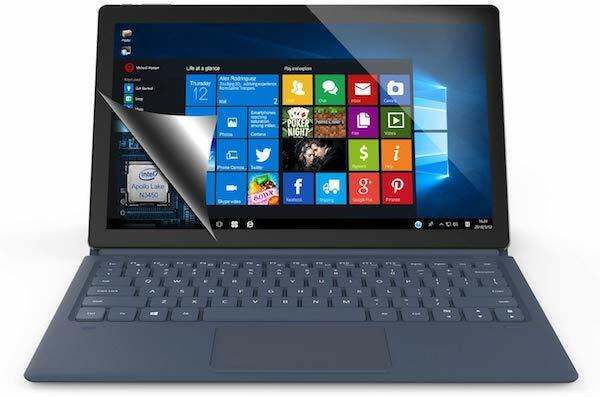 Taking your laptop on a portability drive is easier now due to these tablets which retain the Windows experience. These tablets can cater to different user profiles be it a student or a working professional but we’re sure that everyone will get a perfect one for themselves.